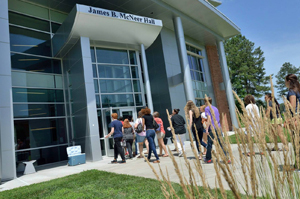 A vital part of Richard Bland’s anti-harassment/anti-sexual misconduct initiatives is ensuring that members of the College community understand the College’s policies and procedures, are aware of the various types of conduct that may constitute a violation of these policies, and know where to turn should an issue arise. The Title IX and Deputy Title IX Coordinators offer the following free training programs and seminars on an ongoing basis to Richard Bland faculty, staff, and students. Training programs, orientation sessions, and departmental briefings can be developed and tailored to specific needs and concerns. For further information or to schedule a program, please contact the Title IX or Deputy Title IX Coordinator. Other offices and student organizations also provide training and workshops. Got only 10 minutes on a busy meeting agenda? The Title IX Coordinator will come to your meeting and provide attendees with a quick overview of the College’s policies against discrimination and sexual harassment, examples of harassment, and advice on where to go for help. Several informative handouts are provided. This 30-45-minute course uses a PowerPoint presentation with discussion of hypothetical situations to engage a group of any size in recognizing appropriate and inappropriate workplace behaviors. Participants will learn about the College’s harassment and discrimination policies and where they can turn for help. This interactive, 60-75-minute session introduces participants to College’s discrimination, harassment, and sexual harassment policies and the many resources available should issues arise. Using real-life examples and small-group interactive activities, participants also examine boundaries on appropriate workplace behaviors. Suitable for groups of up to 50 participants. Individuals in supervisory, managerial, or teaching positions are often the first to learn of harassment concerns and must be prepared to respond effectively. In this 60-minute, interactive and collaborative session, managers will explore strategies for maintaining a harassment-free environment and discuss appropriate responses to a variety of real-life harassment scenarios. Offered in conjunction with Human Resources Training & Development, this workshop highlights the major policies guiding the College’s work flow, including College employment, sexual harassment prevention, conflict of interest, confidentiality, and purchasing and vendor relations. Participants review RBS’s policies and learn how to recognize potential ethical problems and inappropriate workplace conduct and where to go for answers. An interactive training designed to equip targeted participants with the necessary connection, knowledge and skill to increase their proactive and reactive bystander behaviors. Length of training is 6 hours. A short overview speech that can range from 10 minutes to 30 minutes that introduce the basic elements of Green Dot while using persuasive and inspirational language to engage participants in immediate actions. The basic elements of this speech are used to introduce members of any given community to Green Dot, generate community –wide buy-in, and begin the process of behavioral change.